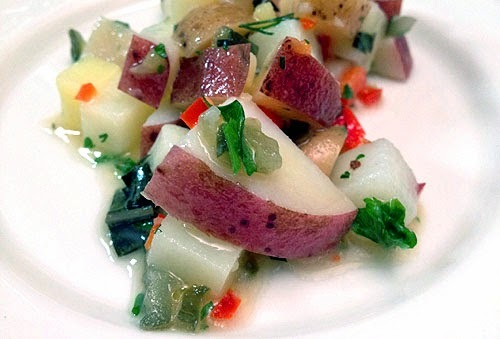 This recipe features TaterPiks, a zesty pickled potato grown in the Klamath Basin by 4th generation farmers. They start with Organic Klamath Pearl™ potatoes, which are infused with a delicious brine and all-natural seasonings. At Rafns' we like to add TaterPiks to appetizer plates and salads. They're also a great addition to potato salads, soups, and vegetable dishes! Find recipes and more information at www.taterpiks.com. Boil the diced potatoes in salted water until just tender. Drain the potatoes in a colander and rinse with cold water. Allow potatoes to drain thoroughly. Transfer to a large work bowl and add the diced TaterPiks, red bell pepper, herbs, and dill pickle. Pour vinegar and brine into the bowl of a blender. With the motor running, add the garlic, mustard, honey, and salt. Slowly add the olive oil in a thin stream as the blender continues to run. Blend on high speed until the dressing is smooth and emulsified. Add 1/2 cup of the finished dressing to the potato mixture. Toss gently. If needed, add more dressing, one tablespoon at a time, until you reach the desired consistency and taste. Served immediately. Transfer the remaining dressing to a glass container with a lid. The dressing may separate. Shake well before using again. The dressing keeps for one week at room temperature. Refrigerate the dressing if storing for longer periods. Bring to room temperature before using.